I’ll admit, I haven’t been all that interested in most recent Hondas, but every now and then something comes along to remind you of the amazing things Honda engineers are capable of. Whether it’s embarrassing GM, pushing the limits of air-cooling, or just being unexpected, Honda’s engineering can often be sublime. Like this little, seemingly insignificant detail on, of all things, a Civic’s in-dash storage cubby. In-dash storage cubbies are possibly the least-engineered parts of a car, I bet. I think floor mats get more engineer brainpower thrown at them than cubbies which, if we’re fair, are basically holes. A decent cubby is a useful little volume to store things. An excellent cubby may even have a little door or lid. What Honda has developed for their 2005 Civic goes so far above and beyond what would be expected of a little crap-holding dash-hole that I just want to squeeze things and scream, in delight and respect. Holy crap, right? A storage cubby is a little, incredibly mundane thing, something that on most cars would be designed to be as cheap and easy as possible, a thing where even having a door, let alone a spring-loaded door would be considered opulent. That’s why the inclusion of that little weighted latch is so amazing. 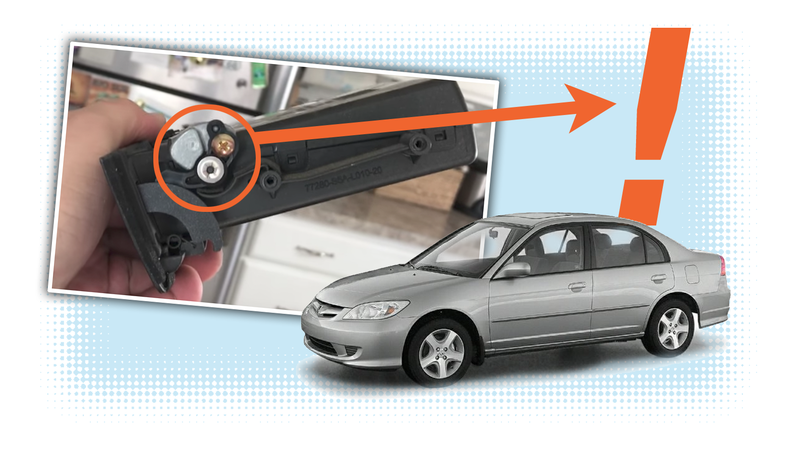 Honda’s crack cubbyhole engineering staff saw a potential problem: on a steep incline, the contents of the cubby may be heavy enough to overpower the spring-loaded door and eject themselves, chaotically, out of the bin and into the cabin of the car. So, to combat this, that little weight swings out when inclined and latches the door shut! When the car levels back out, it releases! Dear Great Sky-Civic that’s a fantastic solution to an under-considered but genuine problem! It’s so freaking simple and elegant and effective I want to buy that part on eBay and take it on a tropical vacation and show it off like it was a gold medal for luge that I won.